On a cold, rainy Friday morning, students, faculty, and sustainability enthusiasts alike came together in the student ballrooms at Sonoma State to watch President Judy Sakaki sign the Sustainability Commitment. “The challenges that we must solve together to mitigate the planet change are difficult and they get worse and worse each year if we don’t do something about it,” President Sakaki echoed to the full ballroom of listeners. The signing of the pact was just the first step in a whole day process. The rest of the day featured conferences on sustainability with a number of vendors showing off their reusable products. 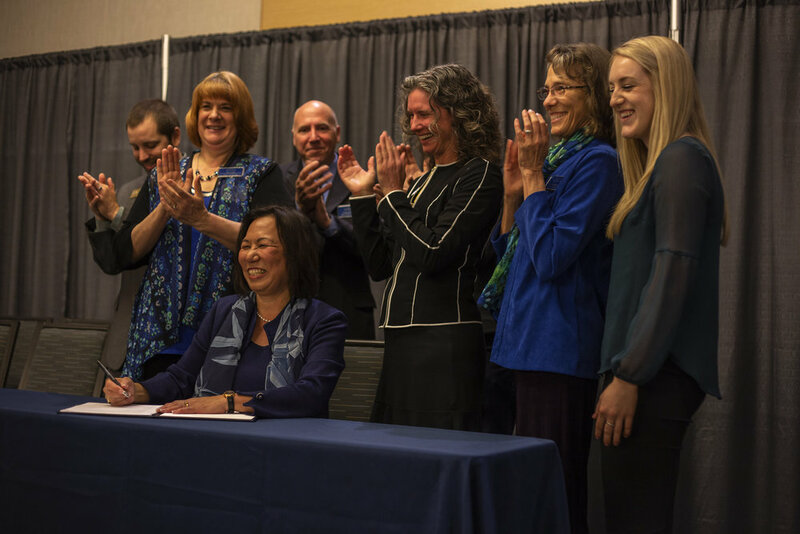 President Judy Sakaki, seen above signing the Climate Pact, spoke at length about climate change its impact on all of us during a ceremony on Friday, April 5. One company that was there was Tech Taylor, or as it is known here, Sonoma-USA, which makes unique products from upcycled materials. The products include messenger bags, laptop and tablet sleeves, shops, bags, dop kits, and duffle bags. “All the stuff that would normally go to landfill and waste we take and upcycle them and are used for sale or gifts,” recent Sonoma State graduate and Sonoma-USA employee Phillip Castro said. 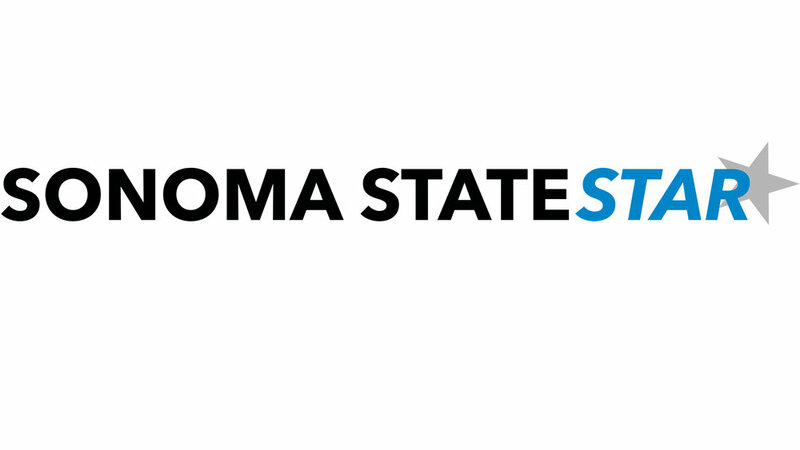 The signing of the commitment demonstrates Sonoma State’s desire to be aware of practicing sustainability. The community was very supportive of the signing with the whole ballroom filled by 8:30 a.m. Friday morning. “We need more than ever to work together and we need to stay committed to the curiosity, to the ethics, and to the drive that has generated this sustainable solution we have created so far; it is going to take all of us,” Sakaki said. As Sakaki discussed the need to work together, she did so in front of people of all ages, people that were there for all different reasons. “We are only here to spread the awareness of upcycling and our products, but are happy to be here supporting Sonoma State,” Castro said. Some students said they were in attendance because they felt more change must be done to relieve our planet from waste and they felt coming to the signing was, at least, a step in the right direction. Faculty members said being at the singing was the right show of support for a cause they believe in. “We can’t afford to throw our hands up and say climate change is too hard to understand or too scary to solve,” Sakaki said. The theme of people in attendance was that climate change is scary and, without practicing sustainability, this planet will no longer be the same. “We are here together today because we share the same beliefs, the belief that it is our responsibility to strengthen the planet,” Sakaki said. Sakaki emphasized that doing nothing will not only impact the people living today, but will affect people who are not even born yet. She said we cannot let the planet just continue the way it is because one day there will be no going back. The commitment is a roadmap of sorts on ways to mitigate climate change. President Sakaki also received a certificate recognizing her for her “outstanding efforts as a leader in higher education and sustainability and climate change” on behalf of the people of the California State Senate and the People of California. After the signing, most people stuck around for the conference on sustainability that featured a speech from Senator Bill Dodd. The conference continued all day with multiple panels and a number of speakers.